1) Assemble the product according to instruction manual, very easy. 2)Place the solar panels in the right place and make sure that they are not obscured by other objects. When the solar panel receives sufficient illumination, the pump works normally. 3) When the water pump is put into the water, there will be air in it, which may affect the water spraying effect. Suggest that after the normal water pump sprinkler, and then connect the spray. 1) The solar panels only when sufficient sunlight can continue to spray water; when the sunlight is insufficient, may not spray water or intermittent water spraying. In addition, as the efficiency of solar panels is affected by the intensity of illumination, the water spraying effect of the fountain will also be affected by weather conditions, seasonal changes, geographical location and other factors. 2) Don¡¯t let the pump does not dehydrate for a long time, otherwise it will shorten the service life of the pump. 3) Please clean the water pump regularly. If there is debris in the water pump, it will affect the normal operation of the pump. 4) Please pay attention to safety when using. Please do not let children use this product. HIGH- QUALITY¡¿This Solar Fountain adopts high efficiency solar panel and new type brushless water pump. It has the advantages of quick start-up , high efficiency and strong stability. let the Solar Fountain on the water, it will be run automatically. Energy comes from sunlight¡¿no need external batteries or electricity, it will runs automatically in 3 secs when bright sunlight shines on the solar panel directly. FOUR SPRAY¡¿Comes with four different spray heads,every spray head has a different spray, convenient to use. 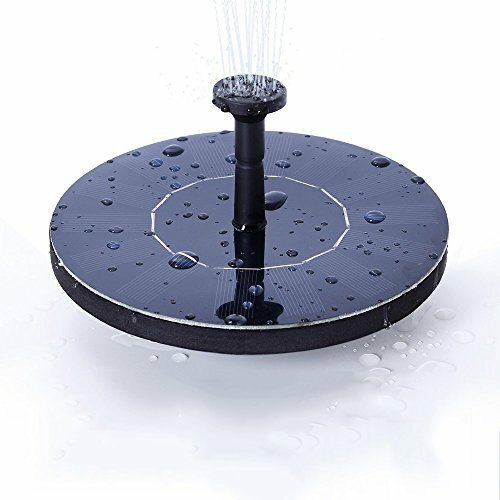 WIDE APPLICATION ¡¿New Upgraded Solar Fountain is perfect for bird bath, fish tank, small pond, pool, garden decoration, water circulation for oxygen and etc. A useful gardening tool for home use. 100% QUALITY SATISFIED¡¿We offer a 12-month warranty for this water hose. If there is any problems about the Solar Fountain, please contact us by email without hesitation.We will try our best to help you. If you have any questions about this product by KeHOME, contact us by completing and submitting the form below. If you are looking for a specif part number, please include it with your message.